What difference does the M2 of the Laser make to a weld? Our range of Fiber Lasers are inherently zero maintenance with all of the traditional Laser components built into a fiber optic. This removes the requirement for re-alignment and makes it a truly industrial tool. Our Fiber Lasers for welding are supplied as complete units in 19” (4U) rack configurations. No further power supplies are required. 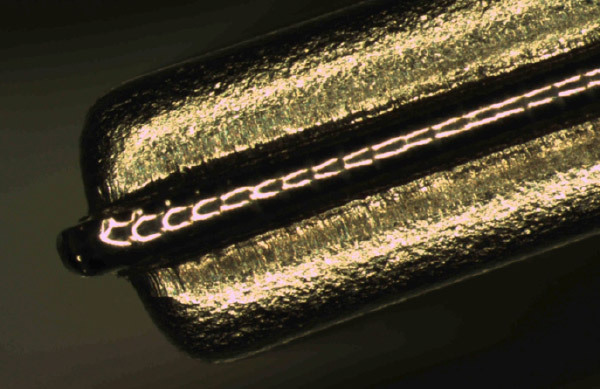 The footprint is significantly smaller than traditional welding equipment which allows the Laser to be placed close to the application or to use the advantages that fiber delivery can give. Standard delivery fibers are provided between 6-20m which allows for the Lasers to be used in highly dynamic applications and are particularly suited for robot based applications. 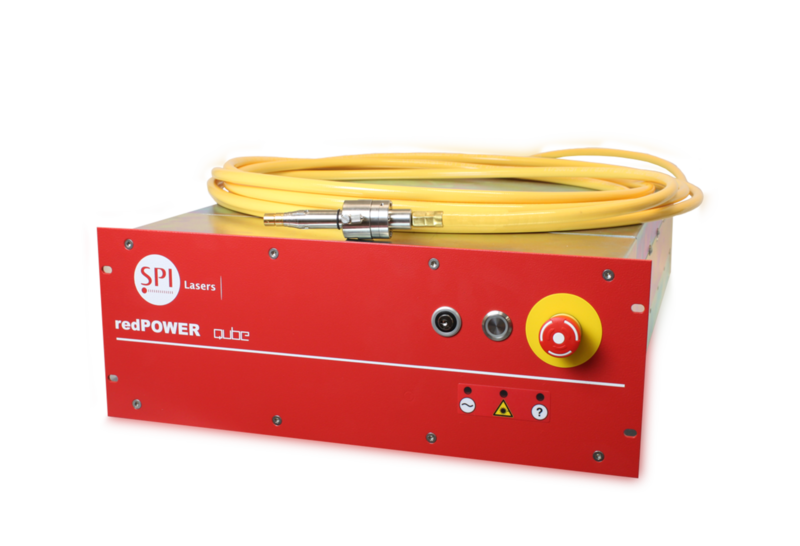 The typical wall plug efficiency of an SPI Laser is 25% or greater. 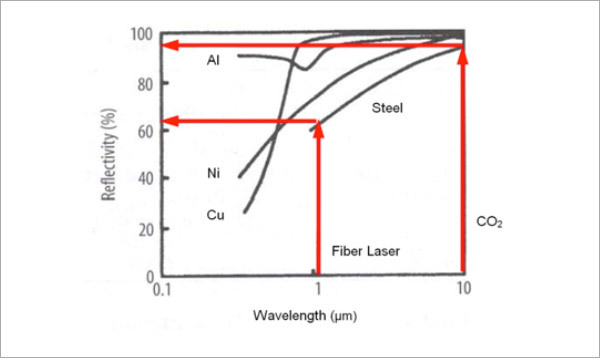 Along with the greater coupling efficiency of the 1µm in comparison to the 10µm wavelength the Fiber Laser is extremely economical. Table 1 shows the difference in reflectivity of 1µm (Fiber Laser) and 10µm (CO2 Laser). This means that more of the energy from a 1µm source is absorbed into these metals than with a 10.6µm (CO2 Laser) source. The importance of the higher M2 values becomes more apparent with welding. The single mode Laser still has a place particularly for deep welds on micro components where the small cross-sectional area can be an advantage. A series of bead on plate welds were carried out to explore the effect on the weld properties of the different M2 values available from our current Fiber Laser product range. Three different Lasers with M2≤1.1, 7.5 and 15 were all run using the same 75mm collimator and 200mm focusing lens. Due to the variation in the M2 values the spot diameter increased from 49µm with the single mode to 266µm with the M2=15 Laser. As table 2 shows, the weld shape is significantly changed due to energy intensity and beam parameters. The single moded Laser produced a deep penetration weld whilst the M2=15 Laser with these particular optics produced a very shallow weld. 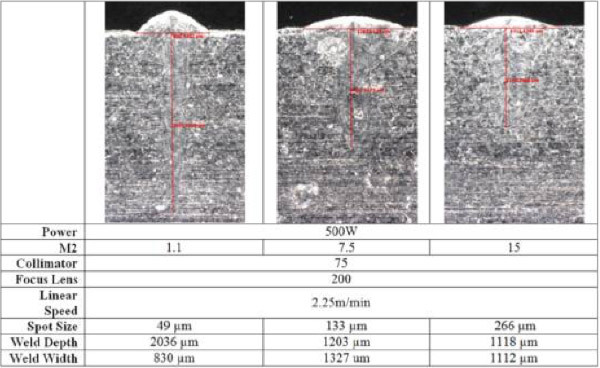 It is unlikely that this combination of optics and Laser would be used in an industrial application but this process shows the affect beam quality has on weld properties. The beam properties of a Laser also have a significant effect on the Depth of Field (DoF) produced at the workplace. A larger DoF is generally produced by a Laser with a lower M2 value. The affect is quite dramatic as can be seen in table 3. The single mode Laser (M2=1.1) with a large depth of field can be used to increase the process tolerance.